Finally some good news on the Phoenix house... we accepted an offer and the closing went smoothly today! With reports on TV left and right talking about just how bad the market is getting for sellers (and always mentioning Phoenix...), I think we feel pretty lucky given just how many houses were for sale. So one more thing done with the whole move! We used the same company that moved us from Minnesota to Phoenix to move us out here and we ended up with the same person, Crista, who both times made our move as easy on us as possible. I don't think we could thank her enough for all the work she did on her end. So, what could we do? Bake something of course! 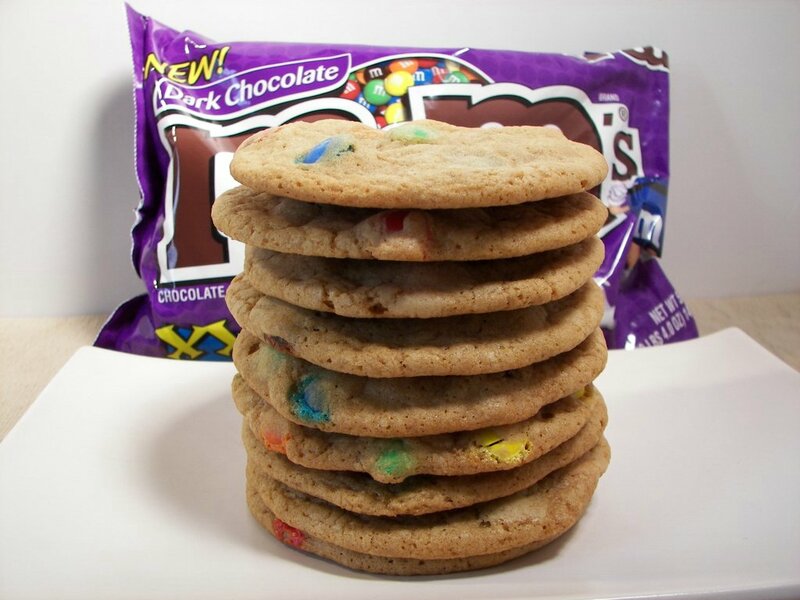 I went looking for a big cookie that I could stuff with the new (well, brought back after popular demand...) Dark Chocolate M&Ms that we picked up at Sam's Club. 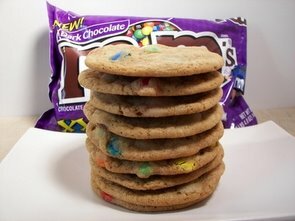 Big, Fat, Chewy Dark Chocolate M&M Cookies is based on a recipe from allrecipes that used chocolate chips. These cookies are as advertised- very big and soft with a sticky chew to them. I did take the extra step while I melted the butter to let it brown just a bit to enhance the nuttiness. I also refrigerated the dough for a good 3-4 hours to help control spreading - they are very much like the large bakery style cookies you would find in the grocery store. Be sure to give these plenty of room on the baking sheets to expand while baking - I let them go long enough to get a light golden around the edges, but still somewhat underdone in the middle to keep them soft with that much-loved chew. We overnighted most of them to her, but had to save a couple because they were so good with the dark chocolate M&Ms. We hope you enjoy them Crista! 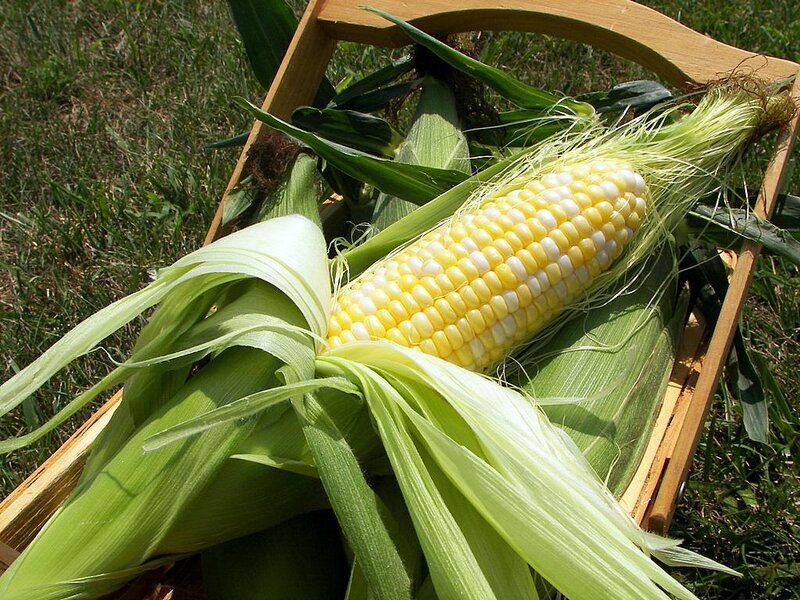 Dinner tonight is the first recipe this week that highlights the fresh corn we got at the market. 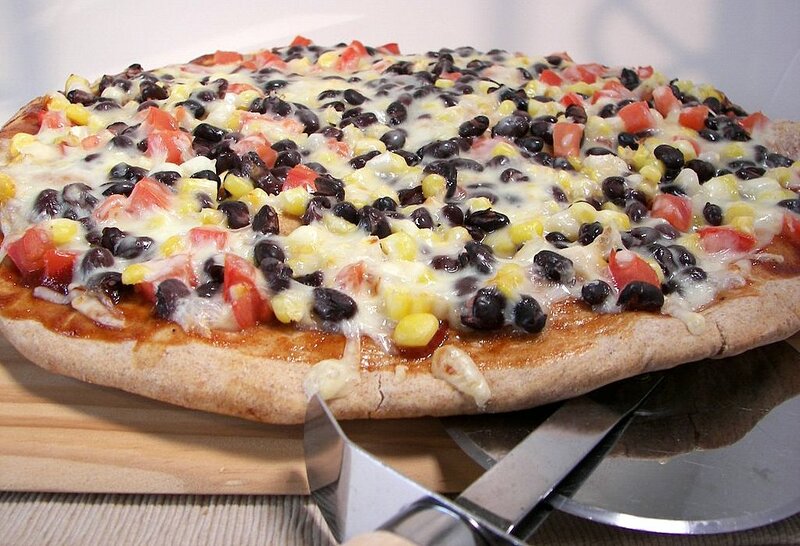 Smoky Corn and Black Bean Pizza is a simple pizza with a crisp whole wheat crust and has a tangy barbecue sauce instead of a tomato base. Instead of using a store bought crust, I made our favorite Whole Wheat Pizza Dough recipe early this morning, let it rise once and then set it in the refrigerator until 20 minutes before I wanted to stretch it out. The dough is made in the food processor and comes together in just minutes - you could even use quick-rise yeast if you wanted to skip the rising. I like the flavor that develops better when you give it a longer time to rise though. The dough is always very consistent for us - soft and easy to stretch. I prebaked the dough for about 5 minutes at 500 on a pizza stone, slathered the crust with BBQ sauce and then topped with a mixture of fresh corn, black beans and diced plum tomatoes. Smoked mozzarella graces the top to finish the pizza - don't skimp on this part, be sure to use smoked if you can, as it brings so much flavor. After another quick trip in the fiery oven, the cheese is melted, the crust is crisp and we couldn't wait to dig in. Sweetness from the corn was a nice backdrop to the smoky sauce and gooey cheese - the little bit of leftovers may just have to be breakfast tomorrow! We headed out to one of the local Farmers Markets yesterday and had to pick up some very fresh and local bicolored corn when we saw it. I have at least three things planned for the ears this week, check back to see what we end up doing with them! Because we are still trying to get into a routine for grocery shopping, I prepared lunch before we left so we didn't have to deal with that when we returned home. I cooked the chicken for the recipe, Creamy Tarragon Chicken Salad, along with the chicken I used for making our normal Saturday Chicken Salads last night. Crisp celery and grapes helped to bulk up the mixture to fill out whole wheat pitas. Toasted walnuts added a nutty richness that paired well with the subtle licorice notes from tarragon. The creamy dressing was not too heavy for this fairly quick and light dish. We've been too busy to catch up with Netflix lately - I do miss being able to keep up with the DVDs, but until there is more time on the weekends we will just keep adding more to the ever-growing queue! *I also finally updated the recipe lists (on the left hand side) - I'm about a week behind now, but I will get that finished up this week. You may have to hit refresh to see the additions. When we roam through Costco, Jeff always seems to take his time going through the bakery department and makes sure to point out the mini brownies they carry. I kept telling him we could just make some at home, so I finally came through on my promise. Mini Brownie Cappuccino Bites are individual sized brownie cups baked in mini muffin tins. 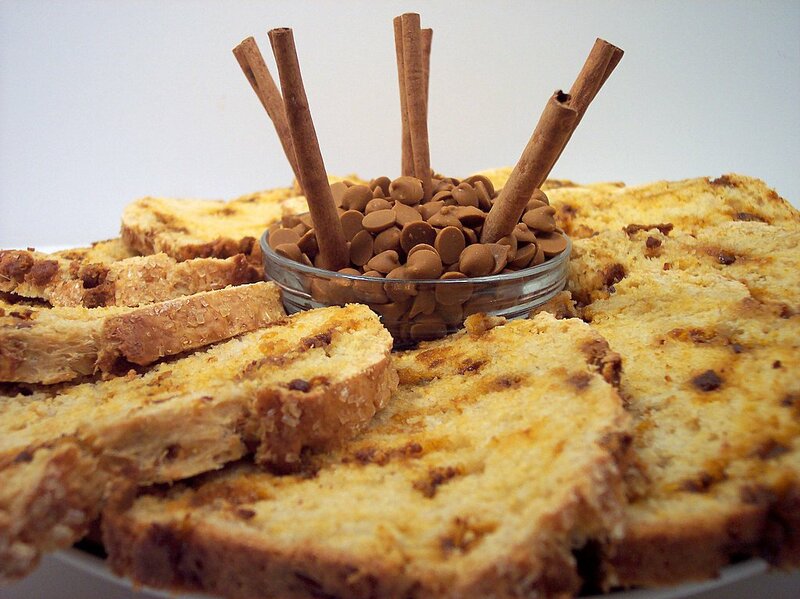 The flavor of "cappuccino" comes out with the addition of espresso powder, cinnamon and nutmeg. Espresso powder (you could use instant coffee as well) amplifies the deep rich chocolate flavor the cocoa adds. Because Jeff loves anything with M&Ms, I scattered mini M&Ms on top after I portioned out the thick batter (which was mighty tasty on its own...). 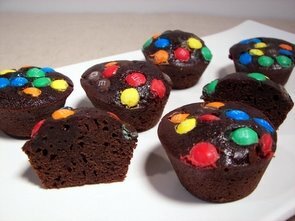 If you wanted, you could just fold them in or use mini chocolate chips - that's less fun though! These intense dark bites do not take very long to bake, so you may want to stay nearby so you can check them. As long as you take them out when they are still slightly wet in the center, they stay pretty fudgy throughout. Jeff gave them two big thumbs up after extensive (he does not share well, I am lucky to get any crumbs!) taste testing. I see it will take a bit to get re-acquainted with a semi-rural life and a big yard. It was pretty muggy today and I had to get the mowing done early in case we had another storm come out of no where. I can't believe how many bugs are out here... just trying to get some trimming done before I brought out the big mower seemed like torture. *Mental note... Must add some sort of bug spray to the shopping list! Even though we do have central AC, the kitchen gets kinda warm if you have the oven going for awhile. I made sure tonight's dinner was going to keep the oven off... but I did end up using the stove top and toaster oven! Wild Rice Cakes with Bacon turned into a pretty laid back recipe as most of the time was spent waiting for the rice blend to cook. Before adding the broth to cook the rice, it is first toasted in a bit of browned butter to enhance the flavor. 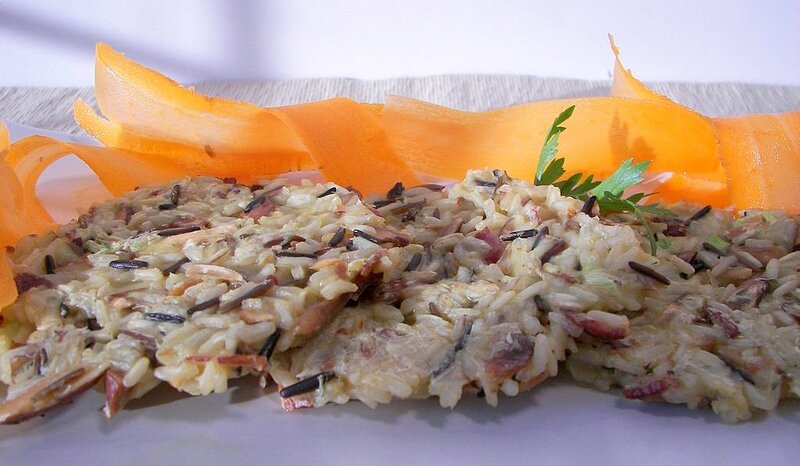 Once tender, the rice is bound together with an egg and flour mixture. Here is when you add the gusto to this dish - toasted almonds, green onions, fresh thyme, lemon juice and crisp salty bacon are mixed in. 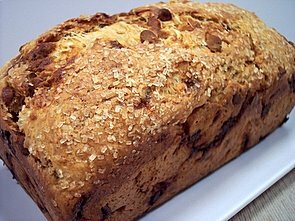 Don't skip toasting the almonds - the richness they get adds so much to these cakes. If you don't want to use the big oven, you can either toast them in a skillet or even throw them in the microwave for a couple minutes! If you felt a little naughty, you could crisp up the bacon first and then use the drippings instead of butter to toast the rice. These could also be easily made ahead of time and gently reheated in the oven for a quick side dish. Smoky, spicy and a little sweet baked beans... err we had beans again?? Beans... as you know, we pretty much stayed away from any recipes involving them since I started cooking. Now that we've finally tried and liked them - I was still a little suprised when Jeff asked me to make a dish that uses them. He would always ask me to skip recipes that even remotely sounded like they used beans - my how times have changed! Jeff asked that I make some sort of Baked Beans, so I thought we would ease in with the recipe Honey-Chipotle Baked Beans. I say ease in because this recipe basically dresses up canned baked beans. 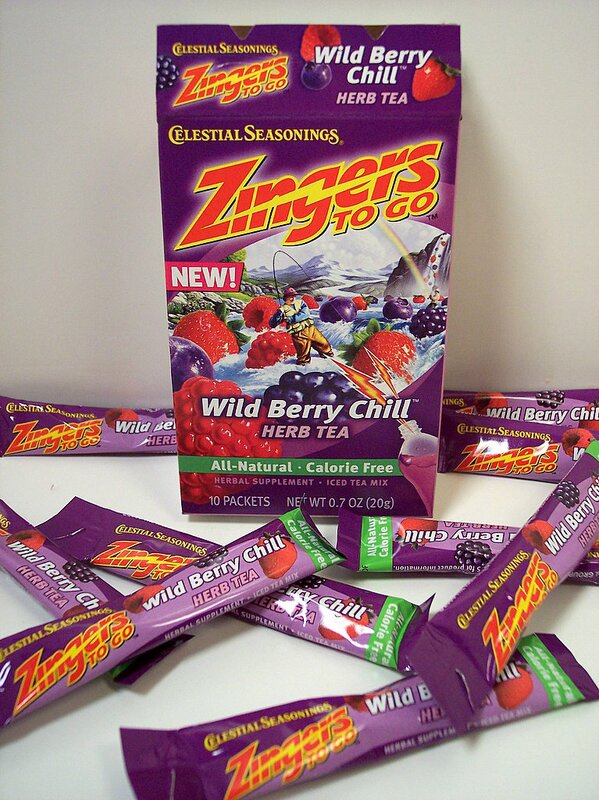 They are combined with a reduced flavor packed sauce that removes any canned taste. 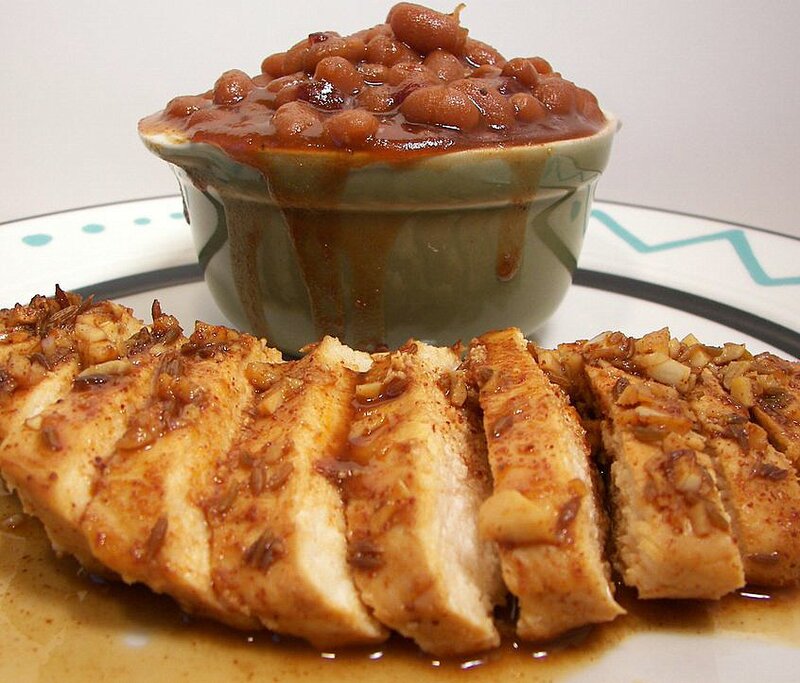 The beans get a smoky background from cumin, have just enough spice from chipotles in adobo, and a little sweet from honey with molasses adding a deep richness. The beans slowly bake in the oven until they are quite thick and bubbling. While I have nothing to compare these to, this recipe sure makes me feel silly for waiting so long to try stuff like this - these were unbelievably good! I wanted to have a chicken dish to go along side and Santa Fe Chicken used ingredients I already had on hand. This dish is a snap to throw together - just a few minutes to make the marinade and then the chicken sits for an hour or so until you are ready to cook them. Right before you throw them in the oven, white wine is pour on top to add a depth flavor to the liquid. As they quickly cook under the broiler, they are basted in the same marinade to ensure they stay very moist. Garlicky with a light lime flavor, this juicy chicken recipe would also be nice sliced over a taco salad or simply served with a side of salsa and sour cream. 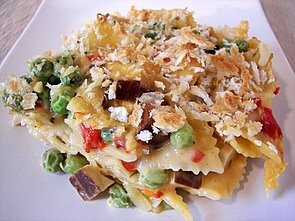 When I opened the small package of tofu for the recipe, Smoked Tofu and Farfalle Casserole, there was a definite aroma - almost like a jerky smell - not in a bad way though! I noticed that it was very solid and diced easily without any crumbling. The original recipe called for raw yellow bell peppers, but since I already had roasted reds, I went ahead and used those instead. You will notice in the recipe you will use the same Dutch oven from beginning to end, which keeps the dishes down some. The peppers, garlic, baby peas and fresh thyme start off the dish by quickly heating them through - then in the same pot, you start the water for the pasta. Once the pasta is cooked al dente (I undercooked it by about 3 minutes from the package time), the pasta is drained and you start on a creamy cheese sauce by thicking some milk and flour. When the mixture is viscous, sharp cheddar is melted in and the tofu, pasta and pea mixture is thrown in to get coated. To add a crunchy top, panko breadcrumbs are scattered over and the Dutch oven is placed in the oven to allow the flavors to meld and add a golden crust. To keep the veggie themed meal going, I made the recipe Balsamic Carrot Salad to have along side tonight. 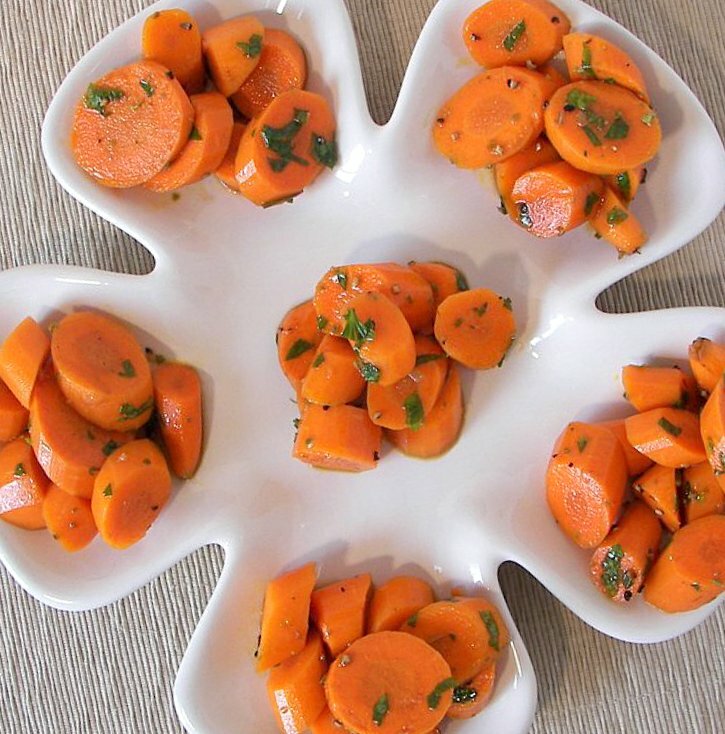 Diagonally sliced carrots are marinated in a pungent mixture of balsamic vinegar, oil, garlic and seasonings. 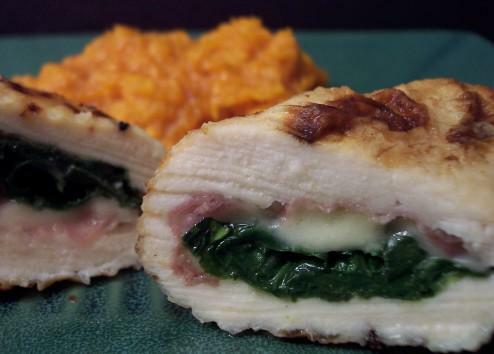 Be sure to make this at least an hour ahead so they have plenty of time to absorb the tasty sauce. Fresh, crunchy, and easy to boot - can't beat that in the summer heat! As we slowly get accustomed to the new surroundings, things are starting to fall into place and we are getting back to normal in the kitchen! We are starting the process to get involved with a remodel of the kitchen, which will inevitably slow us down some... but until that starts, I will be making some dents in the recipe piles! Lots to talk about today so let's get started. Baking on Tuesday for Wednesday Treat Day continues! Looking for a fun cookie recipe, I went browsing through The Cookie Book and found one that caught my eye. This book was published in London and lists weight as well as volume for measurements of the ingredients. I went with the weight measurements and posted the recipe as I made it... I don't think the listed volume measurements in the book are 100% correct. This recipe, Greek Honey Crunch Creams, uses Greek honey, which has a more pungent flavor and is a bit more expensive. 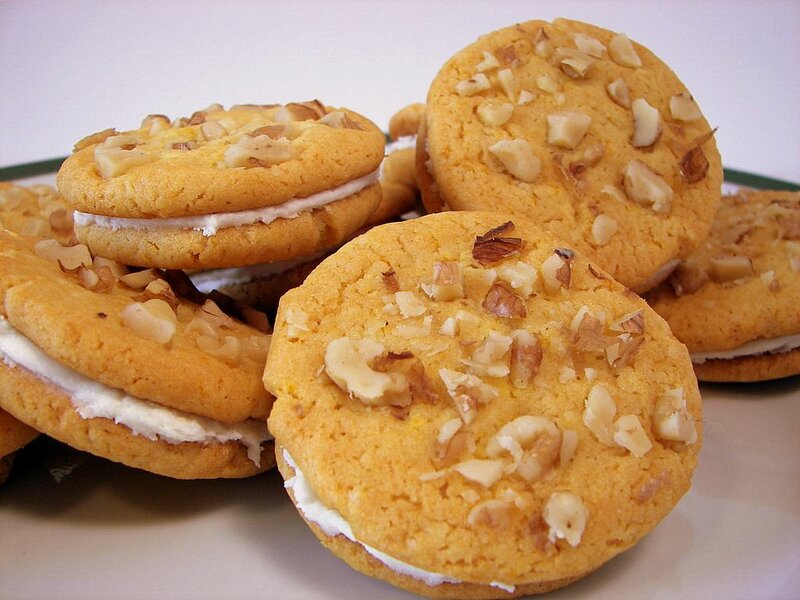 These are a sandwich style cookie that are speckled with flecks of orange zest. The crunch comes from chopped walnuts that are added to only the top half of the cookies before baking - the cookies themselves are more soft and slightly chewy. A creamy rich frosting, with a hint of honey, holds each side together as the sweet filling. 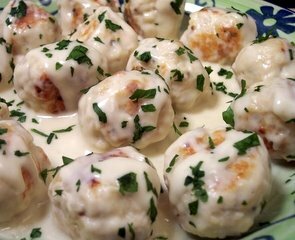 The recipe is a little tedious as you need to portion out 40 pieces and roll into balls - but for this recipe, it was so worth it. Since there are a fair amount of people at Jeff's office, I made two batches of the recipe. I did one with orange zest and one with lemon to see if there was a noticeable difference in flavor. I think the orange version has a slight edge over the lemon, but that is probably because I already like that combo. 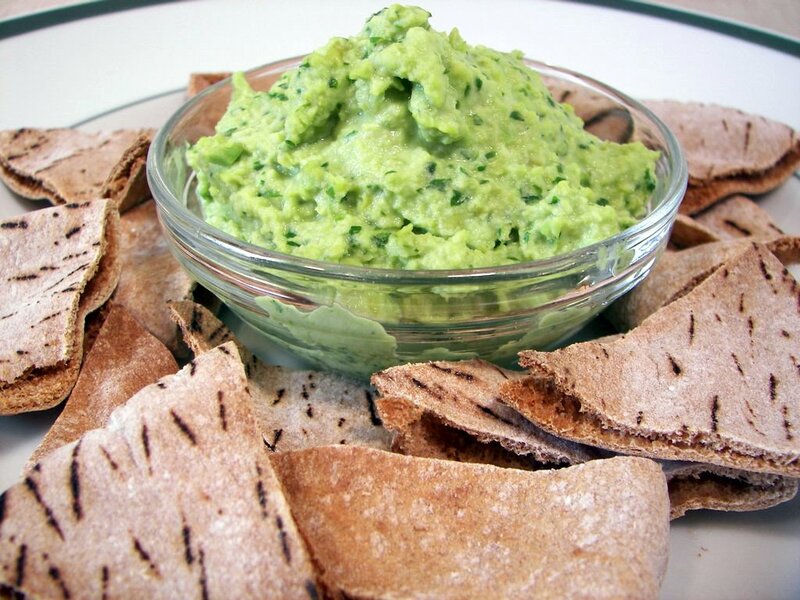 For dinner tonight, we started out with a twist on hummus with the recipe Soybean Hummus. Instead of chickpeas, Edamame adds a vibrant green color and a new depth of flavor. I did have to add a touch more olive oil and about a tablespoon or so of vegetable stock to get it to blend correctly. 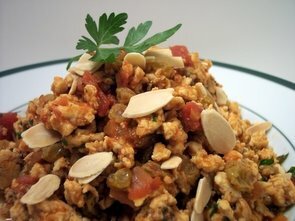 I served this with toasted whole wheat pita bread that I rubbed with a cut garlic clove. This was pretty addicting and we both enjoyed how the zesty fresh dip paired with the crispy pita wedges. I also served Pork Chops with Country Gravy as the main portion of tonight's meal. 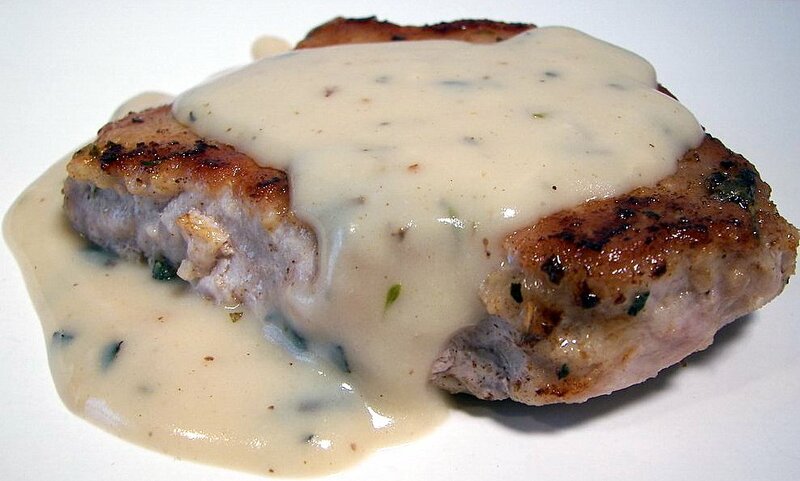 Thick pork chops are dredged in a coating of flour seasoned with marjoram, thyme, sage and salt. After being cooked in melted butter until the chops gain a crisp golden crust, the leftover seasoned flour is whisk together with milk and added to the pan. As it starts to cook, the flavorful bits left on the pan easily release and help create such a tasty thick sauce. The pork remains very juicy with a slight pink in the center. There is enough sauce to drown the chops if you wish, but you may want to serve these with some good ol' mashed taters to soak up the extra. Fresh peaches seem to be pretty abundant out here and we found some at a steal while we were out browsing the markets. I was going to try a recipe that involved pork chops, but I already had something planned for them later in the week. After I went through my stacks of un-tried's, I spied one that sounded really good! 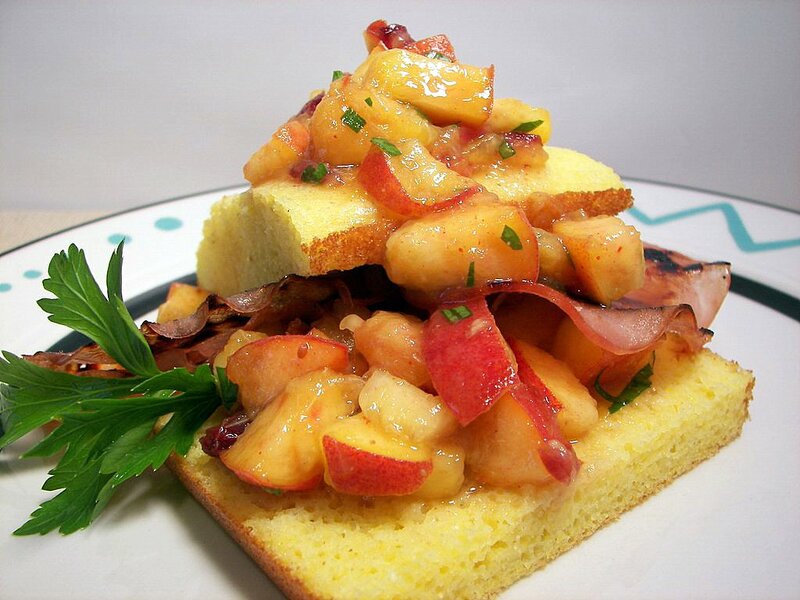 Tonight's dinner, Cornbread Shortcakes with Ham and Fresh Peach Salsa, has a brillant arrangement of colors with an exceptional freshness to it. 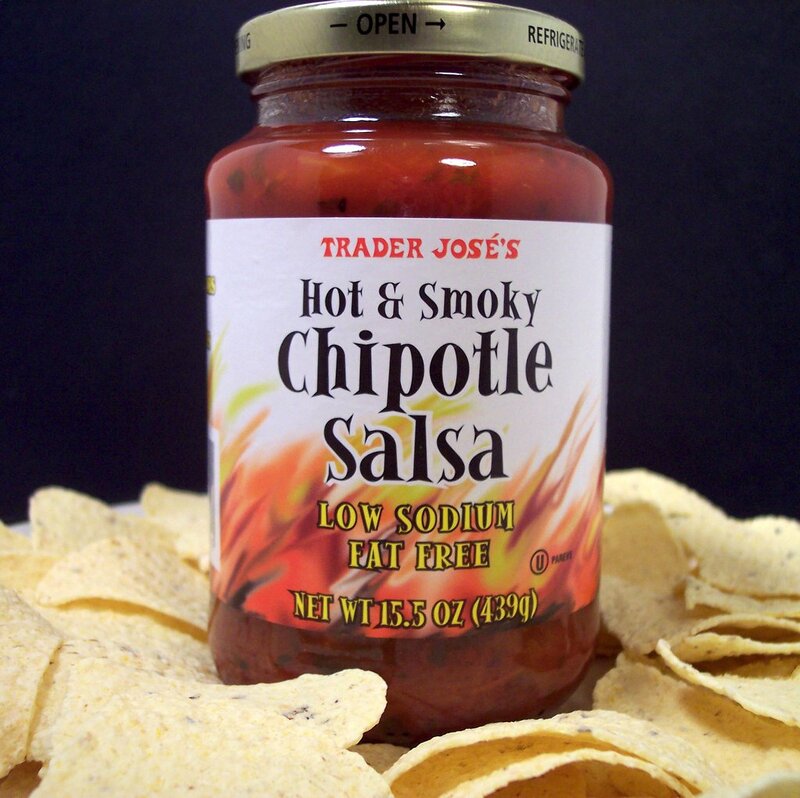 The cool sweet salsa brought in a complex flavor from smoky cumin that played off the hit of spice from red pepper. Orange and lime juice added a tangy zing to the ripe yellow peaches and helped produce a very juicy dressing. The not-too-sweet cornbread cakes were the perfect backdrop to soak up the thick juice while allowing the fresh flavor shine through. To bring an intriguing smoky and salty twist, sliced ham is crisped in a hot pan and then stuffed in between the cakes. Next time, I would try and crisp up some Prosciutto, in place of the ham, as I am sure that would be a great addition. I did leave the peel on the peaches as we don't mind them, but do feel free to remove it if that's what you like! I can't wait to try this salsa on grilled chicken or some pork chops! Time to party... Animal house is here again! After a very long drive through PA and back, we finally have the pups and Miss Kitty back after being away for just about 3 months! While it was nice not to worry about them with all the house junk going on, they are back home and rarin' to go! 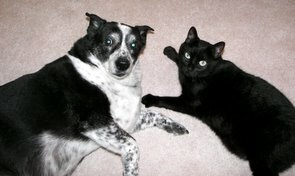 Here's Spike and Miss Kitty testin' out the new carpet - they fell asleep shortly after the picture! Max meets the Alpacas and the stare down begins! Who's gonna win? I wish I could hear what they were thinkin'! Once cooled, the golden tops are finished off with a swirl of honey sweetened cream cheese frosting thickened with a bit of flour. This allows the frosting to be pipped on or you could just frost them with an offset spatula. 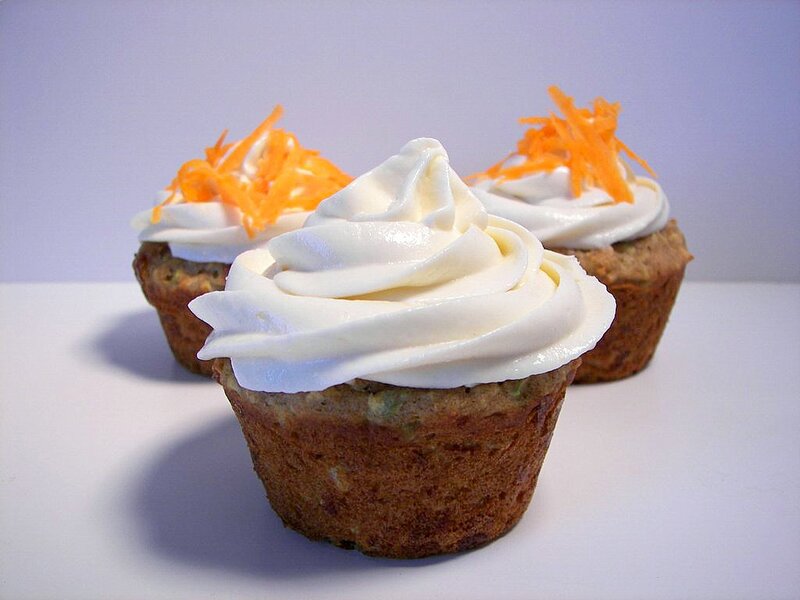 For a festive touch, don't forget to add the shredded carrots! So maybe we went too far with these... but we missed them! They would also be a fun goodie to bring to a doggie party (now now... we know they happen!). I will freeze most of them and then cut into quarters before giving them to the pups for a night time treat. 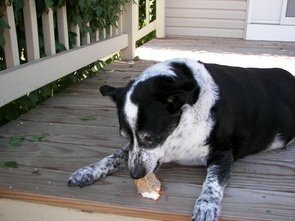 Max woofed his down too fast for a picture, but Spike savored each bite! You may have noticed that we have really taken a liking to figs lately. Even though I have a few recipes waiting to be made with some fresh figs that we have noticed popping up in the grocery stores finally, I already had some dried on hand aching to be used. 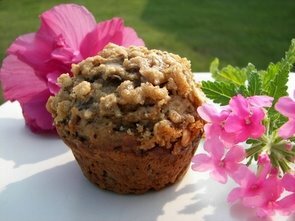 As I was sifting through the recipes, I started narrowing them down to muffins as we needed to stock our empty freezer! 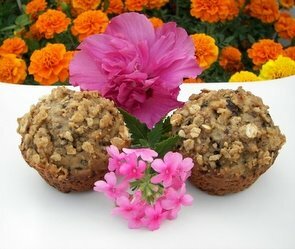 I had wanted to make this recipe, Oat-Topped Fig Muffins, for some time now... but between the packing and moving I couldn't figure out where some of my untried recipes were at. Instead of trying to dice the sticky figs by hand, they are whizzed with the wet ingredients in the food processor. Be sure not to over-process this mixture as you want visible bits of figs coursing through each muffin. These are dense, but not heavy with a distinct fig aroma to them. 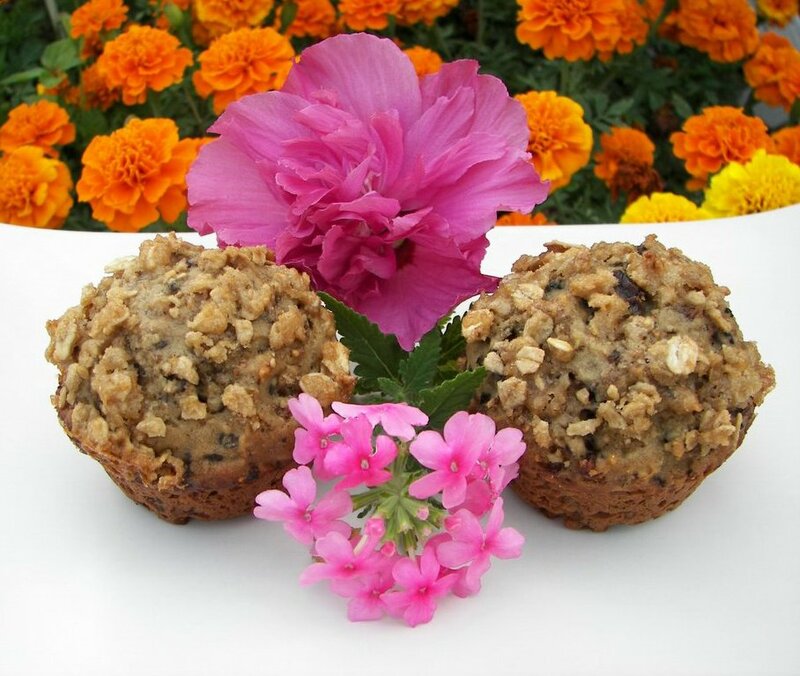 To adorn the crowns of these moist and lightly sweet gems is a rich brown sugar and chewy oat streusel. When Jeff took his first bite, he immediately said "Wow, these are sure figgy... how cool!" As a side note, we actually looked at a couple houses in a town called "Feagaville", pronouced "Figgyville" in Maryland... I wonder if they need an official "City Muffin"! I guess around this area, people always mow their lawn on Fridays... is this a common thing in rural areas or just our neighbors? Just so we make nice, we have started doing the same thing (yeah yeah....) Since I knew I was going to be tired after getting the lawn done along with dealing with more unpacking, I wanted to have a quick and easy dinner that I could throw together. 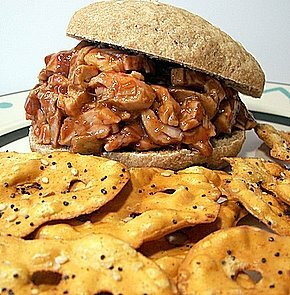 Tonight's recipe, Barbecued Pork Sandwiches, uses up the rest of the Chipotle tenderlion we made the other night. Even though I listed the grilled onions in the recipe, I had to leave them out as we did not have any. The markets here are not very close, so I can't run down the street like we could in Phoenix to pick up one or two things. I am sure they would be even more delicious with them! As I mentioned before, I thought the tenderlion could have used a bit more spice, so I added in some Franks Red Hot. The chewy whole wheat buns along with the tender pork were a snap to prepare and hit the spot after working outside all day. I served them with these tasty and crunchy flat pretzels from "Snack Factory" that we got at Costco this past weekend. 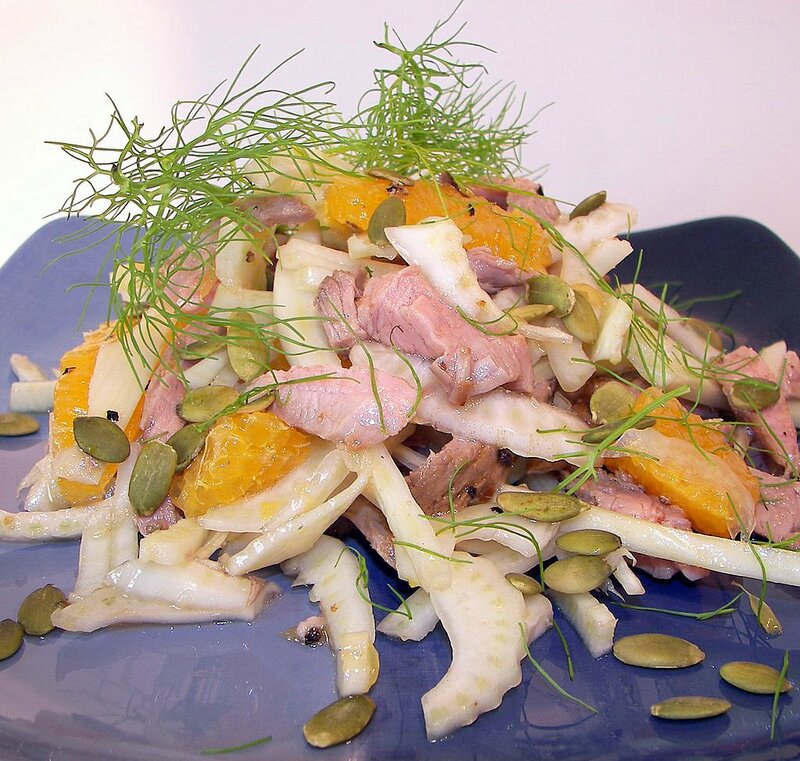 Fennel - why didn't we try this sooner? Dinner last night used another vegetable that we had yet to try. While we like licorice flavor, I would usually pass up recipes that used Fennel as I thought the flavor might be too strong for us. As we found out, this was certainly not the case! Fennel and Grilled Pork Tenderloin Salad showed us that Fennel actually has a slightly sweet and pretty mild licorice taste with a satisfying crunch. The pork tenderlion for the salad is marinated in a mildly spicy orange-chipotle mixture made from fresh orange juice, fresh lime juice, chipotle in adobo, red wine vinegar and seasonings. A light, but generous amount of dressing has a subtle nutty flavor from the addition of walnut oil - you can use canola oil though if you don't have walnut handy. Toasted pepitas finished the dish with another dimension of crunchy texture. I also made one of our favorite biscuits to have along side, Asiago Black Pepper Biscuits. Next time, I might add another chipotle in the marinade to up the heat though. Even though the salad recipe used only 6 cooked ounces of the meat, I knew I was going to need grilled pork tenderloin for another dish this week. I went ahead and used a full pound and kept the amount of marinade the same as there was plenty there to go around. I have the other cooked half in the refrigerator waiting to be used in a sandwich we'll talk about tomorrow! Peaking at the new neighbors... or are they checking us out? Okay - the power must be really flaky here - we've "lost" power (and this post!) 3 times tonight during a storm! From what I hear, the Pecan Sour Cream Coffee Cake with Cinnamon Glaze we made yesterday was a big hit at the office! 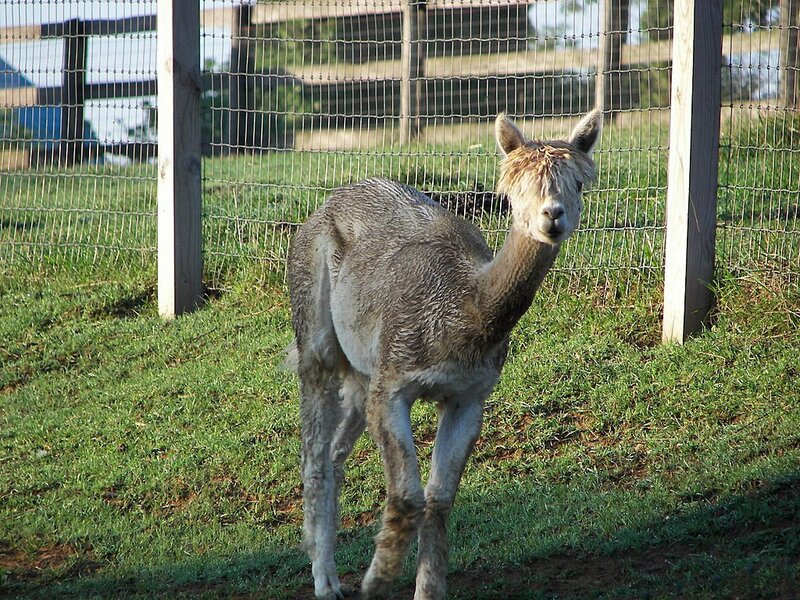 Right behind us are these funny looking creatures - Alpacas! 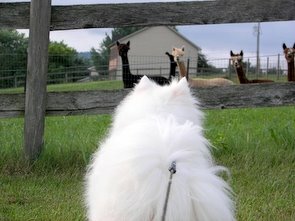 They seem to be very inquisitive with the happenings on the other side of their fence. 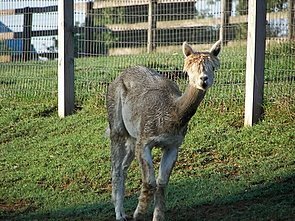 I am not sure if the neighbors breed them, but it would be fun to see what their babies look like! I can't wait to see how the pups react to them when we bring them home! 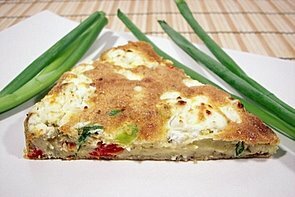 Frittatas are quick meals to make and last night's dinner, Red Pepper and Goat Cheese Frittata, was no exception. They are basically open faced omeletes that start on the stove and are finished under the broiler until they get a golden color and puff up. Instead of using raw red peppers, I wanted to punch up the flavor some by roasting them first. To do this, I cut them in half and flattened them with my palm. I placed them on a baking sheet and they went under the broiler until the skins began to blister and blacken. When ready, I put them in a bowl and covered them with saran wrap. After about 15 minutes, the skins can be easily removed and they are ready for use! I did lose the crunch that the raw peppers might have added, but the flavor made up for it. We both enjoyed the creamy tang that the goat cheese added to the firm, yet still juicy eggs. After procrasting to get the PCs set up, I finally got them put back together with the desks setup down stairs. I was not sure when I would be able to start baking again, but we broke the oven in today! Since tomorrow is Wednesday, I figured it's time to get going so we can start a new weekly Wednesday Treat Day at Jeff's new office! Still no sign of the camera and most of the boxes are unpacked, so we had to pick up another camera - it will take some time to get accustomed to and tweaked so the pictures come out how we want them to. Please bear with us while we work on that! 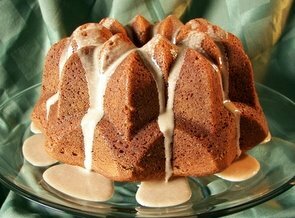 To start things off, I went with a Pecan Sour Cream Coffee Cake with Cinnamon Glaze. I was intrigued by the recipe because you don't start off by creaming the butter and sugar. Because very soft butter is added to the dry ingredients with half the wet, the butter coats the flour and helps make the cake dense, but not dry. Using sour cream in the recipe as a main portion of the wet ingredients also keeps the cake quite miost. 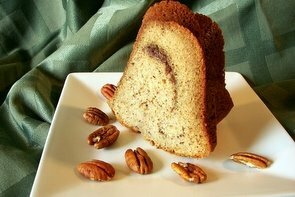 Each piece of this rich and nutty cake has a sweet surprise swirl inside from ground toasted pecans, dark brown sugar, flour and cinnamon. To add another dimension of nutty flavor, ground toasted pecans are also added into the cake batter. Even though this cake is delicious on its own, I wanted to add a finished look so I drizzled a sweet cinnamon glaze on top. I don't often make glazes, so I probably should have made this one a bit thicker, but I didn't want to add too much sweetness. I hope Jeff's new co-workers enjoy this tomorrow! We are a day behind on dinners since I was not able to post yesterday. Let's start there and we will try to catch up during the week - last night I made Chickpea Burgers and Tahini Sauce. I was a bit nervous since Jeff is not convinced he likes them yet, but he was quite happy with the results! 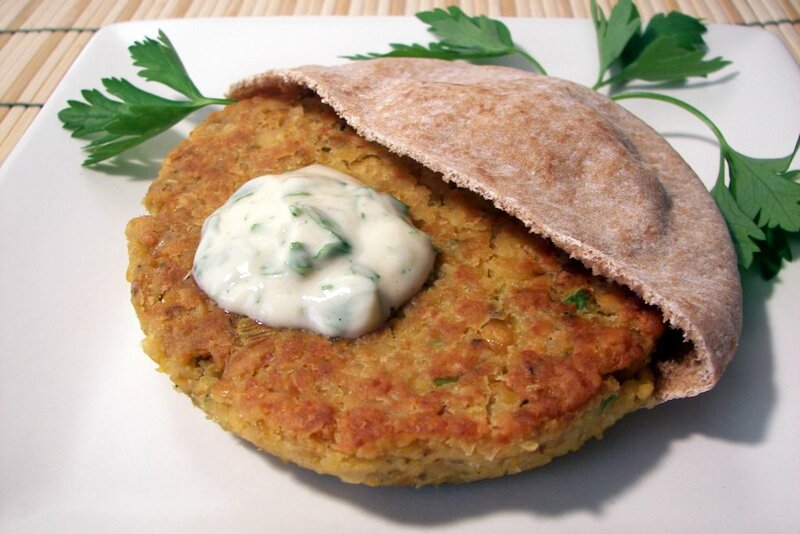 These thick burgers are a mixture of chickpeas, fresh green onions, oregano and smoky cumin with an egg and flour acting as the binders. They are pan-fried in olive oil until they achieve a golden brown crust - these held together surprisingly well while they were flipped. The use of Tahini in the tangy sauce was a first for us and will be seeking out recipes that use it now! There is a generous amount of sauce that matched the large burgers perfectly, but for the picture I only added a small amount. My pitas were also on the small size - we couldn't find the ones we used to get when we made the trek to Trader Joe's. We had the rest for lunch today and they reheated very well! *Please note that my e-mail has changed - click on the link in right hand section under "e-mail us" to get the new one! Well... I was all ready to talk about dinner we had tonight when my laptop decided it was going to have a meltdown.... I will be back tomorrow as I will get my main PC put together and we will continue on with daily posts! Sorry for my absence! This also means I've lost any e-mails you may have sent in the past couple days that I had not had a chance to respond to - please feel free to resend if you wish! We are currently sitting in the middle of what feels like 300 half opened boxes as we slowly unpack and start the whole move-in proccess. The cable people showed up yesterday and we have internet access again - hooray! I guess we have some signal issue in the house, so we can't have TVs where we want them just yet. Unfortunely, no sign of our camera yet, but we are hoping for the best. It could be a little slow around here until we either find it or bite the bullet and buy a new one. We should be up and running again by the end of this week at the latest - we need to get some grocery shopping done and check out some of the farmers markets to stock up! Oh... and 1.1 acres takes a fairly long time to mow... even with a riding mower! What a change from our postage sized piece of lawn in Phoenix! I apologize for being a few days behind replying to comments, I will do my best to get caught up tomorrow afternoon. I actually did the same recipe for dinner tonight that I made for a lunch before we left.... so at least we have a picture to share! 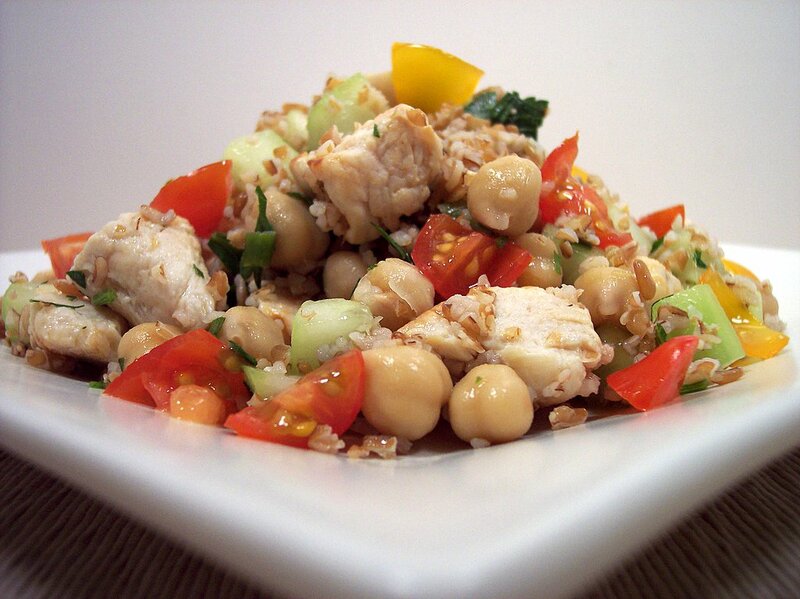 Tabbouleh Chicken Salad is a light and filling salad with the bulk of it coming from bulgar. While I soaked the wheat in hot chicken stock, I cooked the chunked chicken breast in a tangy dressing of fresh lemon juice, olive oil, garlic and salt. After the chicken and bulgar is mixed together, the salad is tossed with nutty garbanzo beans (also known as chickpeas), cool fresh cucumbers, juicy tomatoes, green onions, parsley and a punch of flavor from mint round out the dish. The remaining dressing brightens the flavors and keeps the salad moist. This was fairly low matinence to make and was a welcome change as we get back to eating normally. I think we used up a few trees with as many documents we had to sign today... we did get a couple nice coffee mugs filled with lots of chocolate out of the deal! Everything went well during the final walk-through and we closed on the new house this morning. The excitement quickly fell into a bit of nervousness as we realized we "officially" own two houses. Scary, but hopefully we can get something happening with the Phoenix house - there are just so many houses in the market now that people are certainly taking their time choosing. I can't remember which day, but Jeff wanted something spicy and seafoodish for lunch before we left. 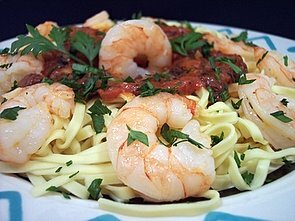 I knew we had some raw shrimp in the freezer, so after searching through the recipe stacks we ended up with Shrimp Arrabbiata. Since fresh pasta takes just a minute or two to cook, I waited until the end of the recipe to dunk the pasta instead of trying to keep it warm. The chunky fire roasted tomatoes brought a subtle smokiness and ensured the sauce would be thick. It was not as spicy the first day, but as it sat overnight, we noticed it grew more intense. I think a habanero or jalapeno would be in order next time. I don't like how shrimp reheat in the microwave, so I pulled them aside before we reheated the pasta and sauce. If you are running behind, this would be a nice last minute meal as it is pretty quick to make. As I mentioned before, I did get a chance to make some new recipes for lunch and breakfast before we left. Since Thursday morning was going to be my last chance (or so I thought anyway...) to make something, I went ahead with a new pancake recipe for breakfast. 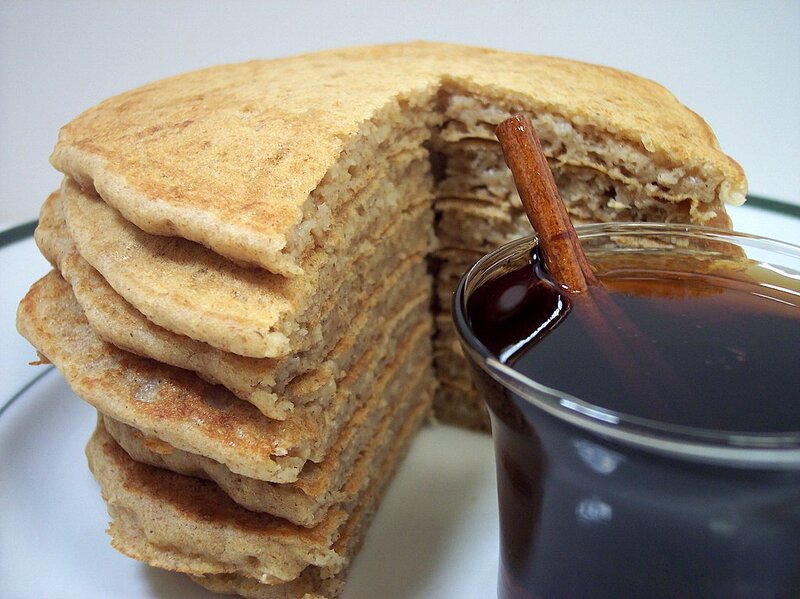 Banana-Oatmeal Hot Cakes with Spiced Maple Syrup starts out by making a killer sticky and warm dressing for these pancakes. Maple syrup is spiked with a cinnamon stick and whole cloves, brought to a boil and then allowed to steep to soak in the spicy flavors. As the mixture cools, you can begin the tender cakes. 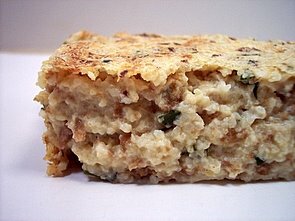 Cooked oatmeal makes these bit more dense than other recipes, but the hearty texture made sure for a filling breakfast. Mashed ripe bananas brought a subtle sweetness and went well with the nutty flavor from the mixture of half whole wheat and all-purpose flour. I found the batter to be much thicker than normal, so I gently helped the mixture by spreading it out with the back of a spatula. Skip this step if you want extra-thick cakes. After a bumpy 4 1/2 hour plane ride to Cleveland, an overnight side trip to pick up one of our cars and see our pups/kitty at Jeff's Moms house and finally... a 4 1/2 drive across PA - we arrived at the hotel in Frederick! What a weekend! We'll be living out of here until the moving truck comes at the end of the week - then the fun begins with unpacking! Because the movers would not take certain pantry items, I found myself with a bag of Cinnamon chips that I didn't want to throw out. I decided to make a loaf of the Cinnamon Bread that we have made quite a few times before now since I can make the recipe from memory. I did change one thing, instead of the cinnamon/sugar topping, I sprinkled on some raw sugar for a crunchy finish. We saved a couple slices so we could have it as a snack on the plane and I'm sure the packers enjoyed their pieces warm from the oven! I hope we are able to find some of the chips out in the area as well! We snapped these before the camera went "missing". Now that we are out here in Maryland permanently, there was talk about changing the website name as we are no longer "in the desert". What do you think? Do we change it? Keep it the same? The movers were here yesterday packing up the house and came back today to load the truck... the house is now empty (echo... echo... echo...) and we are "officially" on the move! The past couple of days have just flown by and I didn't even get to cook or bake anything... boo! We are flying back east early in the morning to pick up the car we drove out with the pets a few months ago. We will drive back over to Maryland on Sunday and then we wait until Thursday when we close on the new house. In other news... it seems our camera may have been taken (sigh...) during the whole process. We will have to wait and see what happens in that department once we get settled in - until then it looks like we may have to look into getting a new camera. I do have a few new recipes that we made last week with pictures that I will be getting posted over the next week - check back to see what else we ended up making! Thanks for all the support and well wishes - hopefully the rest of the move will go smoothly! It has come to the last home cooked meal in Phoenix as the movers will be here tomorrow to pack up the place. I may not be able to post everyday as we will be dealing with the packers, flying out east and dealing with the closing. We will "officially" be in the new house next Friday - Woo! I've been making a few new recipes for lunch over the past few days that I need to write about, so we will be posting new recipes throughout the week. Jeff told me a long time ago that he has never been a fan of creamed corn - but I think that is because he has only had it from a can. The fresh corn is just too good to pass up nowadays, so I thought I would give it a go and see if we could change his mind. The recipe, Creamed Corn, turned out to be delicious and was insanely easy to make. 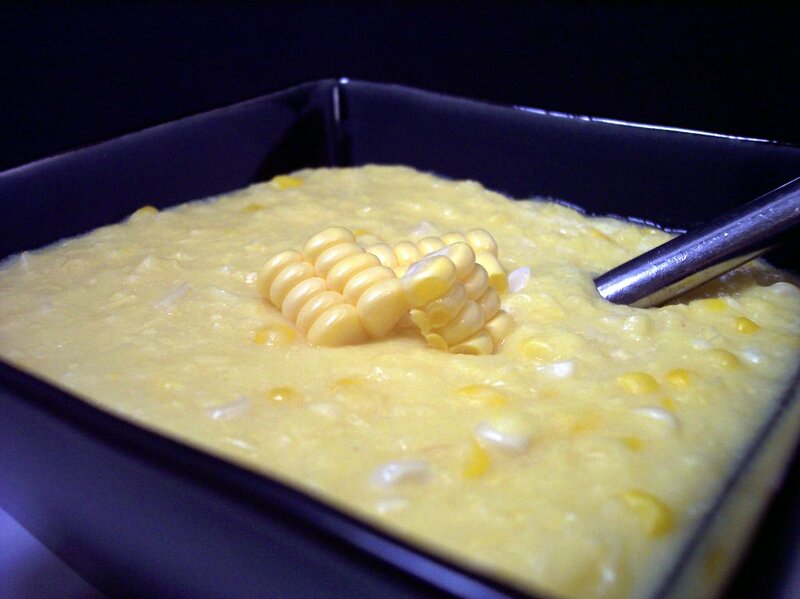 I used a combination of fresh yellow and white sweet corn that was pureed with milk, cornstarch and a touch of salt. A cup corn is set aside to lend some texture to the smooth mixture. Once the puree and whole kernels are combined, the corn is allowed to simmer until it thickens up and the kernels are tender. I did have one issue... while I used a "medium" saucepan, I had a lot of problems with the mixture "burping" hot corn everywhere, as I think my pan was not deep enough. I ended up using a splatter guard, but it still made a mess... so be careful as the hot corn mixture does not feel good on the skin! Jeff ate more than his share and said "Why didn't you make this before? And just so you know, I get the leftovers! I love creamed corn now!!" Bah.... at least there is one more thing to check off that he will eat now! I did finish using up all the leftover chicken from the freezer with the recipe Chicken Picadillo. You can use pre-ground chicken, but after using the food processor to make our own lately, I have come to the conclusion that I like the resulting texture a bit better. Not as mushy as I find in the store. Since I had to dirty up the processor anyway, I used it to mince the garlic first, then added the chicken and pulsed both of them together. This mixture is then browned with some seasonings and then the chipotle salsa along with golden raisins are mixed in. After cooking down, the mixture is finished with some sliced toasted almonds. The smoky chipotle salsa brought a fiery heat that was a perfect off-set to the sweet plump raisins and crunchy almonds. At first bite, I was unsure about the cinnamon, but as I ate, I found myself enjoying the complex flavor it brought. While you could serve this alone, this would be an awesome filling for tacos or placed on some flatbread. Be safe if you are out and about tonight! We've come to the last baking for the Wednesday Treat Day we started at Jeff's previous office here in Phoenix. It has been a lot of fun trying out new recipes and having lots of great feedback on the outcome! Hopefully Jeff's new co-workers will not mind him bringing in treats - I will probably keep it on Wednesdays as it seems like a great way to break up a long week with something fun. 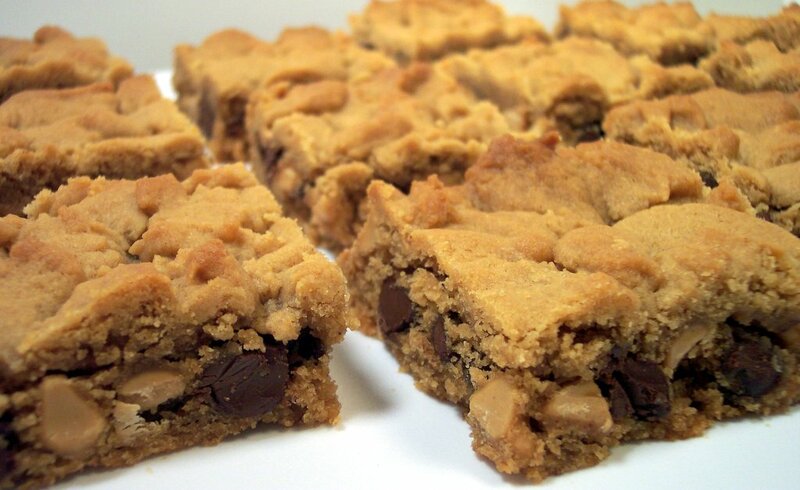 Today's recipe is definitely made for peanut butter fanatics out there, myself included! Chocolate And Peanut Butter Filled Peanut Butter Blondies is a mouthful for a recipe title and for trying to eat the bars themselves! 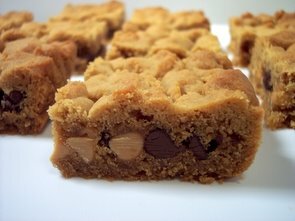 The bars are like two giant soft peanut butter cookies with a chunky sweet layer of bittersweet and peanut butter chips in the center. 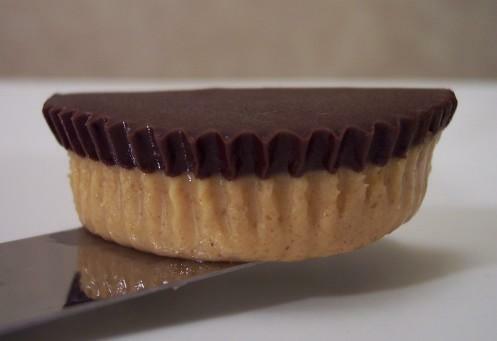 I worked hard to savor each bite as the intense peanut butter flavor melded with the rich chocolate from the heat in my mouth. In the instructions I talk about dropping small dollops of batter on top of the chips - if you try the recipe, be sure to give this a go. The top spreads out as they bake, but they remain bumpy on top with some open areas where you can see the chips trying to poke out. They may be a little tough to test for doneness, so underdone is better than overdone here - you can place them in the refrigerator to firm up, if needed, to make cutting easier. Dinner tonight, Grits and Sausage Casserole, turned into an interesting way to fix up grits. 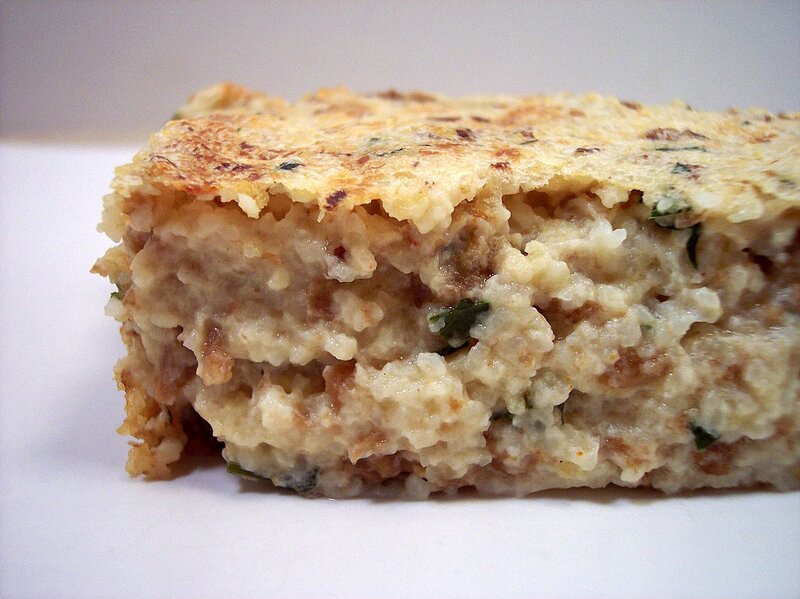 Quick-cooking grits, which help hasten the prep time, are mixed with sharp white cheddar, parsley, seasonings, and lean turkey breakfast sausage. The interesting part comes in when you gently add in egg whites that have been beaten until stiff peaks. This lightens the mixture, so as it bakes, it slowly puffs up and changes the texture. The grits are not as dense and are almost fluffy. Next time, I might try using some soy crumbles and maybe a different cheese to change the flavor some. This would be a great brunch dish - light, but still filling. Not the easiest thing to take a picture of though! Even though it was not a new recipe, I did do some baking today. 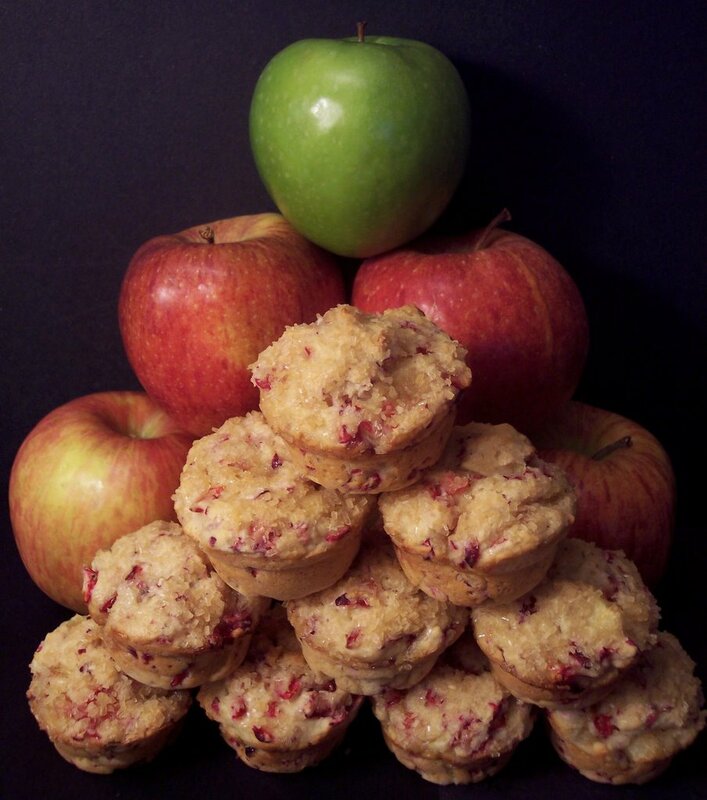 Jeff asked if I would use the last of the frozen cranberries to make his favorite Cran-Apple Muffins. 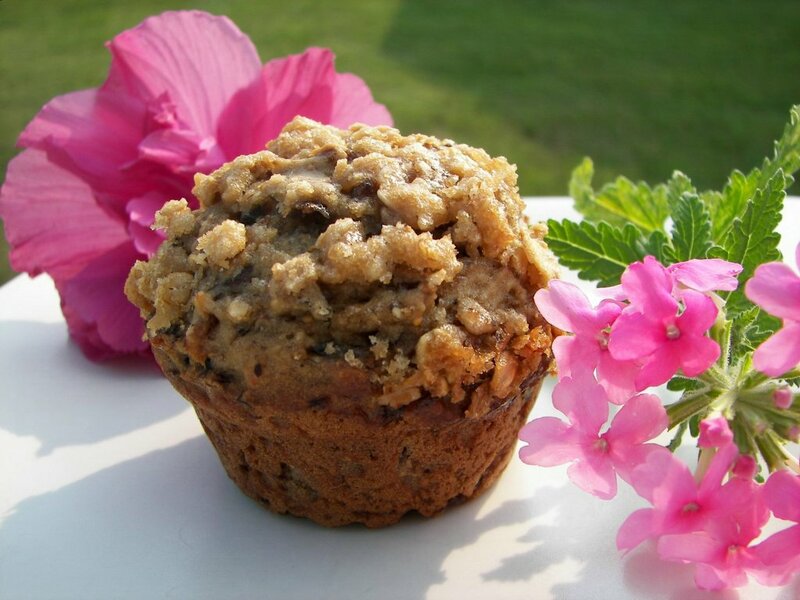 As most muffins do, these freeze very well and make for a filling snack. Since I was looking to get the chicken in the freezer used up, I made Swedish Meatballs tonight. As the recipe calls for ground chicken, these meatballs are a bit lighter than recipes that use ground beef/pork. The chicken is lightly seasoned, so some may think they taste a little bland by themselves, but the sauce confronts that problem head on. The meatballs are first seared until they achieve a golden crust, and then in the same pan, you start the sauce. Once slightly thickened, the meatballs are added back in and allow to finish cooking while the sauce reduces. The sauce has a thick robust texture with a tang coming from sour cream. When I think of Swedish Meatballs, I believe the sauce has a rich and darker color, but this one keeps it fairly light. Egg noodles, served along side, were a delicious way to soak up the generous amount of sauce. I liked the unique hint of rye that the bread added, be sure to use it if you can! It probably didn't match well, but I had a ton of carrots I needed to use - so I also made Spiced Carrots as a side. 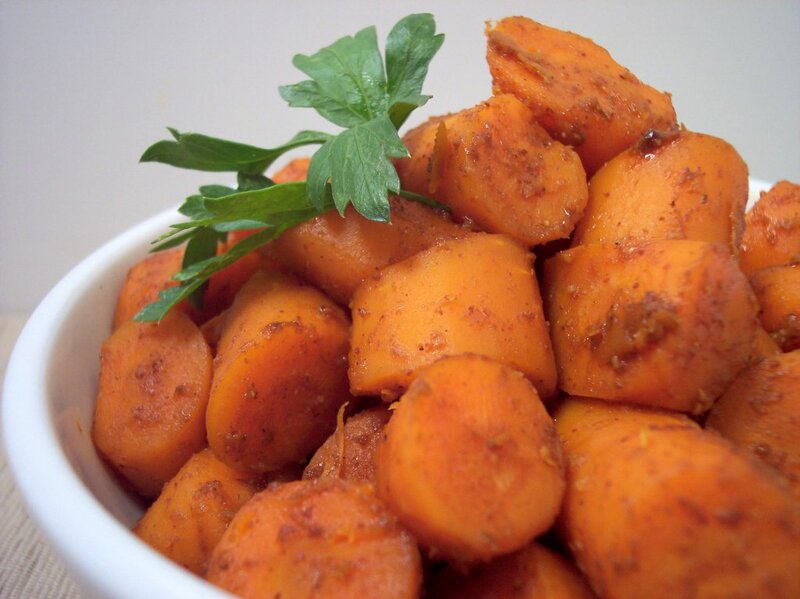 Chunky carrots are cooked in a flavor-packed mixture of garlic, chili powder, cumin and lemon zest. I cut the cooking time down to just over 10 minutes as we like our carrots with a bite in the center. If you like a softer texture, leave it to cook the full amount to time. The smoky cumin along with a slight heat from the chili powder was fresh way for us to doctor up plain carrots. The splash of fresh lemon juice at the end heightened the flavor and helped to bring out the sweetness of the carrots. It all started when I talked about a typical Saturday for us... and now today the blog is one year old! Yes, we still even have chicken salads on Saturday nights! We have since tried and posted over 400 new recipes that we made! Whew! I was looking back and was surprised that we have only had a couple flops, but that was mainly due to our taste buds and not so much the recipes. I did not think a year ago that we would be here still talking about our ever evolving palate and our fun adventures in the kitchen. I started the blog as we were beginning to branch out from a set rotation of recipes and we were wanting to try new foods... our family and friends couldn't believe we were eating more than chicken fingers and fries! We have done a couple face lifts to the blog, but I think we are pretty happy with the layout now - it's not perfect.... but it works for us! I hope that we are able to give some inspiration to play around with some new recipes we share and to have some fun in the kitchen! Well, this was also our last weekend in Phoenix! We are flying back to Maryland for the last time at the end of this coming week - it went by so fast! I'm not sure how long it will take us to get settled in, but it should be an interesting experience - we don't close on the new house until the 13th. We will be living out of a hotel until then... oh boy! Expect a fair amount of chicken recipes this week as we try to get the rest of it used up from the freezer. 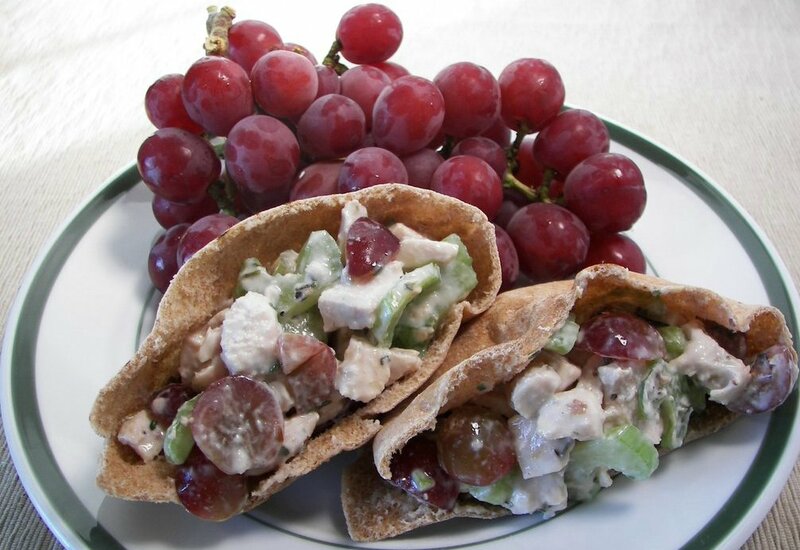 We did make 11 new recipes this week - it was hard to pick out favorites, but I think the Easy Fruit Ice Cream, Fish Tacos with Broccoli Slaw and Breakfast Fig and Nut Cookies were excellent. As we did our final round of grocery shopping today, we did pick up a couple of new items we saw. The first is one we will be using in a recipe this week - I snuck a taste and man... it is spicy! I drink a lot of water each day (250-300 ounces) and while I try to get Jeff to have it plain, he prefers to drink it flavored either by having it as Iced Tea or crystal light. We saw these at the market today and the first thing I noticed was that it is sweetened with Stevia! While I don't have anything against Splenda or other sweeteners, it is nice to see companies starting to use alternatives. We tried it and were both pleasantly surprised! I don't enjoy the taste of tea much, but this is sweet with a strong berry-like flavor. While it does not taste like fresh berries, I didn't notice any aftertaste and it was a nice change from plain ol' water. They come in these fun single use packets to add with about 16 ounces of water - it will definitely come in handy at the hotel at least! 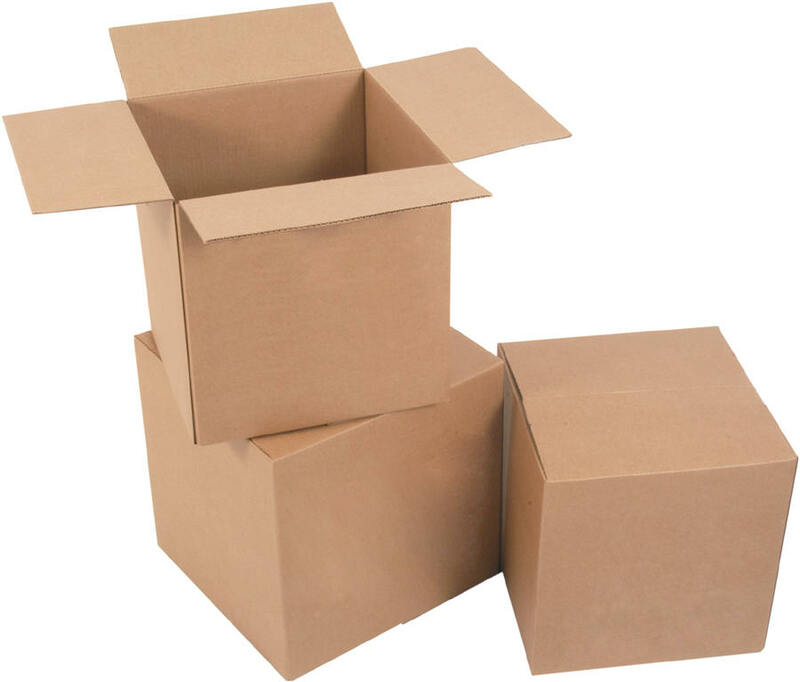 The packers will be here Thursday and they will be loading the moving truck on Friday... I'm going to try and sneak in as much baking and cooking as I can before that - but we are pretty busy trying to get things separated and ready. PS - If you were at Costco today and happened to loose your Platinum Wells Fargo Debit Card, we found it and called the bank to let them know we had it. They placed a hold on your account in case someone copied down the number and was going to use it maliciously. Hopefully we stopped someone from doing that, but I don't know how long it was lost! We didn't have much time at the house this morning, we had to get everything cleaned up and leave as we had an open house today. After we left, we ended up at a Saturday market and found some nice looking organic strawberries - I had just the recipe in mind as soon as I tasted one. Served in tall slender glasses, Strawberry Cream took very little prep time to throw together and only needed some extra time to set in the refrigerator. 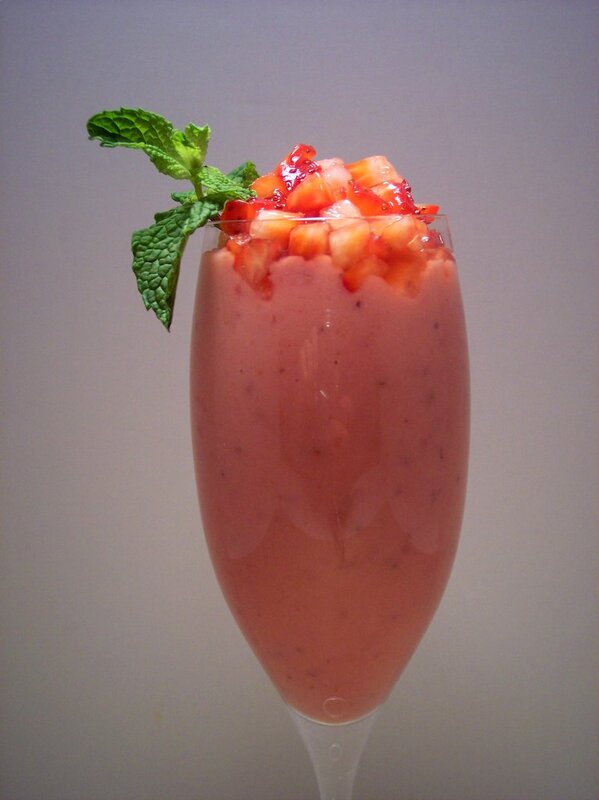 Delicious fresh strawberries are pureed with vanilla scented granulated sugar and a dash of vanilla extract. To add some richness to this light strawberry base, sour cream is added, followed by some dissolved gelatin to lend some body and texture. The creamy soft set mixture is finished with more fresh strawberries that have been diced and allowed to macerate with a touch of sugar to cajole some juices out of them. Garnished with a sprig of chocolate mint, this was a cool and refreshing way to wind down this very busy Saturday.